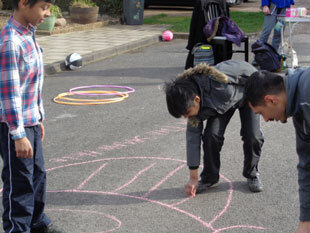 Hounslow Council has made it easy for local communities to close residential roads to through traffic so that children can play outside safely. As a council, our aim is to improve children and young people’s health, wellbeing and quality of life, through play. The idea is to create a traffic-free space for children to play together, and for the adults to be able to chat together too. You can close your road once a month or even once a week – it’s completely up to you and your neighbours. The application to have a play street is open all year round so don’t let a bit of rain or cold weather stop you from applying to close your road in the upcoming seasons. For many, this will be the first chance to explore the space outside the front door on their own. Parents may pop by, but this is kids being kids: playing with soft balls, chalking on the pavements, racing up and down on bikes, meeting other kids of all ages and from different schools. To help residents to set up their first play street, the council has developed template posters and letters as well as the ‘Play Street Pointers’ pack. Its full of lots of tips on how to get your neighbours involved, how to apply for a street closure and games and activities for all times of the year. It is currently free to apply for a play street. Any roads applying for their first play street in 2018, will receive a free ‘play street starter kit’ with things like chalk, bunting, clay, outdoor games and more. If you want to go and see a play street in action before you apply for one on your road, contact us to find out where the nearest one to you is taking place.